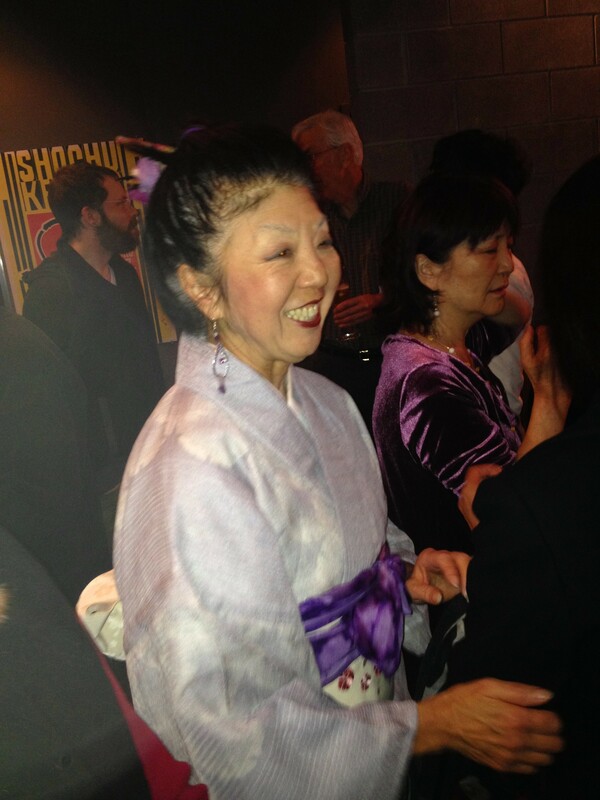 Club members Sharyl Kato and Majid Sarmadi organized a beautiful evening dinner and Japanese cultural program at the Sushi Muramoto Restaurant on March 27. 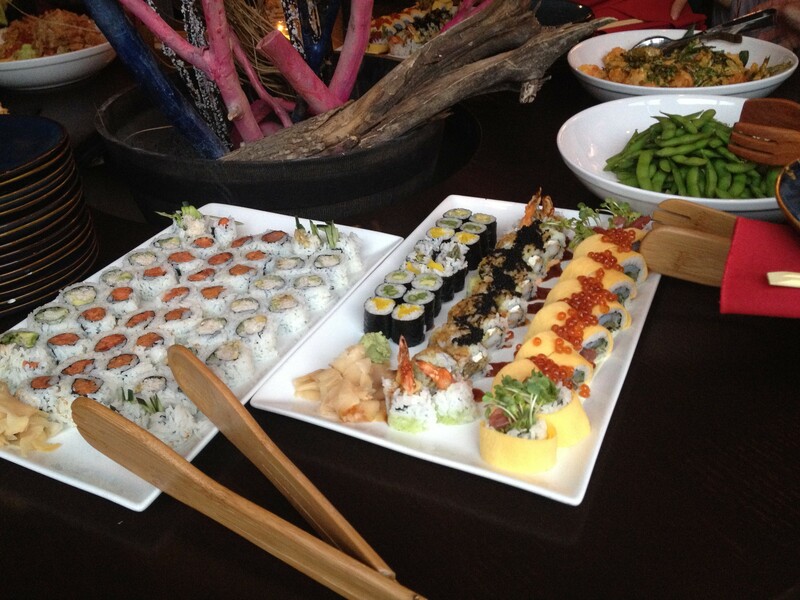 The food, in buffet-style, was artistically arranged. 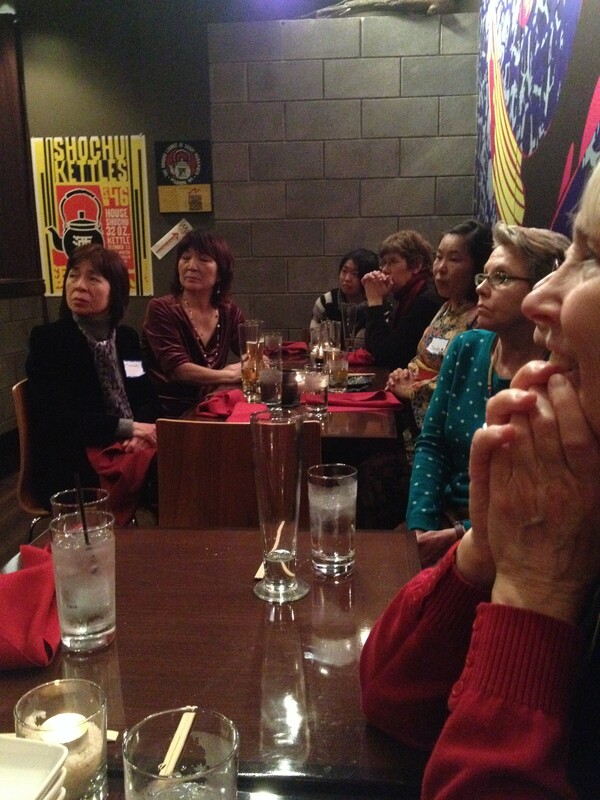 Rotarians and their guests attending mixed with members of the Japanese community in Madison. Jo Oyama-Miller presented an excellent overview of the relationship between the sister cities of Madison and Obihiro which was formed in 2003. Because of this relationship, there have been a number of inter-cultural exchanges between the two cities. One of the commonalities between the two cities is the mutual interest in organic farming. There are plans to establish an all-year farmers market in Madison with the help and experience from the Obhiro community. Another common interest is in community mental health. A vocational rehabilitation program centered around organic farming in Obhiro has been established as a model program. Matt Morris, one of the chefs in the Muramoto Restaurant, told us about his experience spending 7 weeks learning Japanese cuisine and sharing his knowledge of American cooking. We also were shown the kimono (Sharyl Kato shown at left with a traditional kimono) and some of the newer versions where the obi is already tied. We had a lively discussion of the do and don’ts in the Japanese culture and the significance of bowing and eye contact. All in all, it was a delightful evening of good food, camaraderie, education and cultural exchanges. The Second Century Committee hosted a networking Happy Hour at Sardines on October 22. There was a great turnout of members and prospective members as well as guests from other Madison Rotary Clubs. 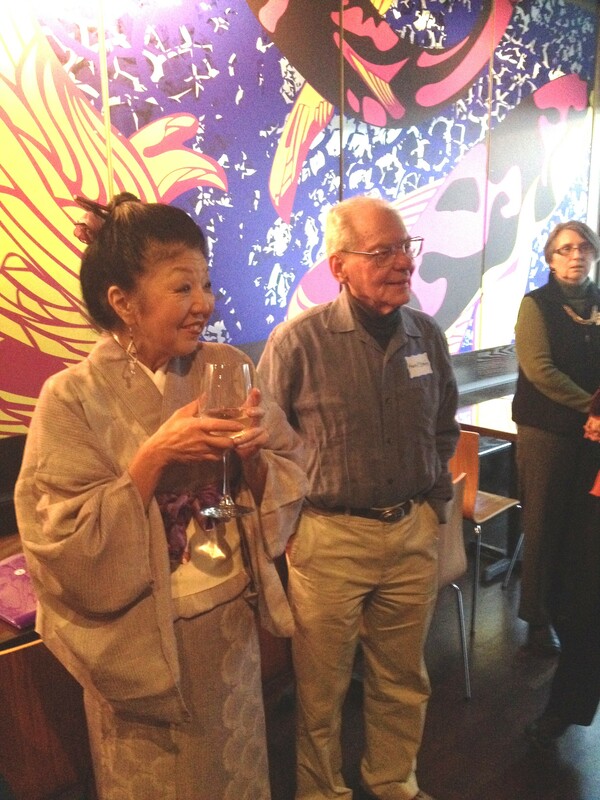 The event was open to the entire Downtown Rotary membership, and we had a diverse turnout across all demographics! 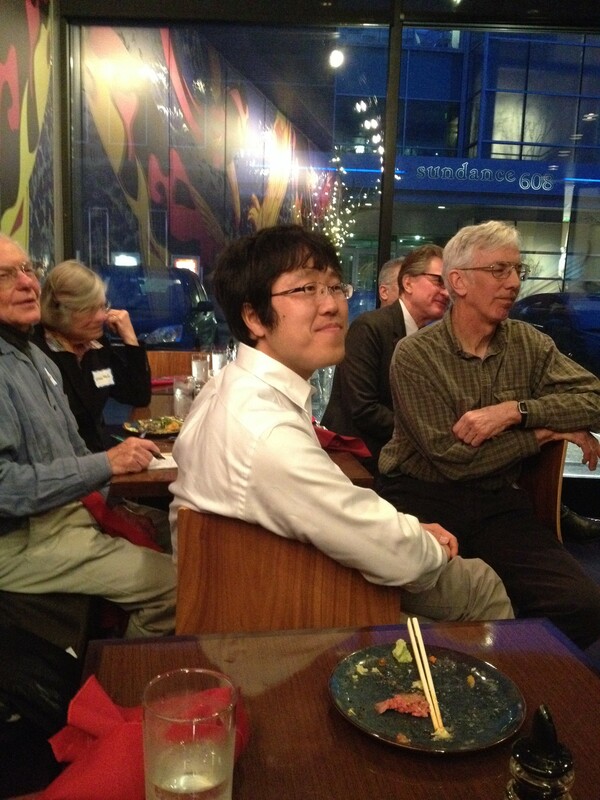 Members had a chance to get to know each other– socializing at Sardine, one of the coolest settings in Madison. Stay tuned for similar Second Century events coming! About a dozen Rotarians and guests enjoyed a splendid evening at Kurdish Culture and Music Night sponsored by our Rotary Cultural Awareness Fellowship Group at the home of Majid Sarmadi. The first part of the evening’s events consisted of a short talk about the Kurds of Iran, Iraq, Turkey and Syria, who would like nothing more than to establish their own homeland, Kurdistan. Adel Ardalan and Chiya Saeedi–who are Iranian Kurds and UW Ph.D. students in computer science and electrical engineering, respectively–presented a power point explanation of the complexities of Kurdish languages, music, art, dress, customs, and cuisine, which differ greatly from the Arab, Turkish, and Persian majorities of their countries. In a brief, informative, and entertaining presentation Adel and Chiya did a remarkable job of explaining a complicated subject with knowledge and wit. We next had an opportunity to taste some of the delicious specialties of Iran provided by Majid, including pastries, nuts, and a wide variety of dried fruits. Majid also provided superb fruit from his own garden. Cherries from Majid’s tree made a wonderful warm beverage. One other component: a surprise birthday cake to celebrate Nate Brand’s birthday. After the repast, we were treated to a concert of Kurdish music played by Adel and Chiya on several Kurdish stringed instruments and a unique, resonating, hand-held drum. Music–and dancing–are important elements of Kurdish celebrations and festivities. The musicians were really skilled and the music was not only interesting but enjoyable. At the conclusion, Adel and Chiya played and sang the Kurdish equivalent of Happy Birthday to Nate. It would take a writer far more able than I to capture the hospitality of the evening provided by Majid and the enjoyment we shared as we learned about Kurdish culture from our tutors Adel and Chiya.